The map above shows a very rough estimate of the current electricity costs of mining one Bitcoin by country around the world. Based on our research, Kuwait is the cheapest country in the world to mine Bitcoins while the Solomon Islands would be the most expensive. Overall, Bitcoin’s total electricity consumption is huge. In November last year we reported that Bitcoin Mining Now Consuming More Electricity Than 159 Countries Including Ireland & Most Countries In Africa. As of March 2018, that number has increased to 173, which would mean if Bitcoin mining activity were a country it would be the 47th largest consumer on earth (slightly less than Kuwait but more than Greece). Overall, the total amount of energy devoted to Bitcoin mining stands at 53.28 TWh according to the Bitcoin Energy Consumption Index, an increase of 83% since November 2017! 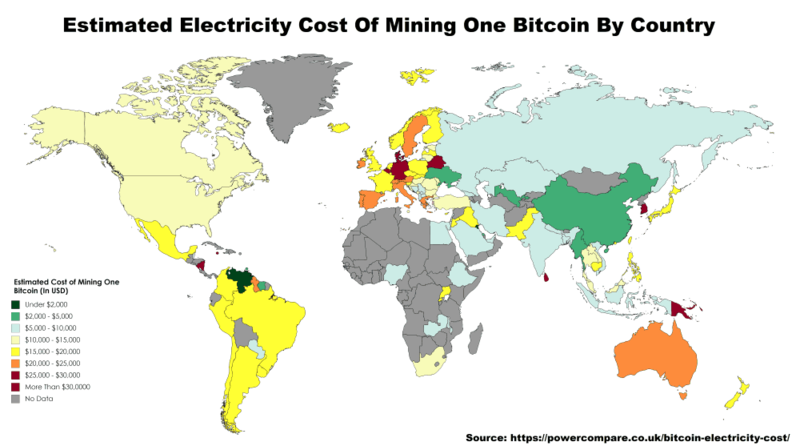 Despite the increase in electricity required to mine Bitcoins and dramatic decline in the price ($11,455 at the time of writing), mining remains hugely profitable in certain countries with cheap electricity. The 5 cheapest countries are: Kuwait ($1,415), Venezuela ($1,630), Myanmar ($3,087), Bahrain ($3,628) and China ($3,645). The 5 most expensive countries/territories are: Solomon Islands ($80,189), Belarus ($71,698), South Korea ($53,173), Vanuatu ($51,458), and the US Virgin Islands ($43,225). For electricity consumption we used the Bitcoin Energy Consumption Index, which currently estimates that it takes 781 KWh of electricity per Bitcoin transaction. We realise that many people dispute the values from this index, but you can about the Criticism and Validation of this index here and make up your own mind. Worst case this estimate is too high and the real energy costs are less making mining cheaper. For the number of Bitcoin transactions per block, we used and average of Blockchain’s data as published on Quandel for February 2018. It showed that there were an average of 1,372.65 transactions per block for that month and each block currently represents 12.5 Bitcoins. For electricity prices per KWH we used Eurostat data for Europe and Wikipedia‘s estimates for all other countries. When there was a range we took the midpoint and when there were different prices based on subsidies, we took the price without subsidies. Prices for Europe are inclusive of VAT and all other charges. And all prices are based on the residential prices rather than the commercial or industrial price (which can often be far cheaper). And all prices have been converted to USD based on official exchange rates. Given how incredibly complex electricity pricing can be, these prices are only estimates, but are likely significantly higher than what professional miners actually pay. This gave us a price in cents so we divided by further 100 to get a price in US dollars. The map was created using MapChart.net. Thanks for your suggestion, Beth. Where did you get prices for ukraine, here are for residental use about 8-10 cents. i see near 10 countries with wrong prices – belarus, ukrain, bulagaria, macedonia, moldova and so on. Finally is it safe and optimal to install in Ukraine the miner ? which city of Ukraine is the best for installation ?